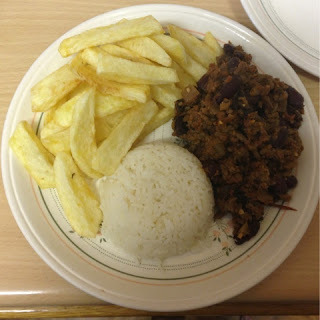 Slimming World Diary: Chilli ..
Chilli has got to be one of my favourite meals at the moment, not only is it gorgeous tasting, it is completely syn free. Put it with rice, chips, jacket potato or even bread to make sloppy Joe's, make sure you syn the bread though. This evening for dinner I had rice and chips, I didn't make the syn free Slimming World chips today, I put them in the fryer which is 4 syns every 100g. I did this because I hadn't had any syns today. Chilli is really easy to make and the leftovers always get put in the freezer, they don't really last long there though. 1. Spray a large frying pan with Fry Light and stir-fry the onion and garlic for 2-3 mins. 2. Add the chilli powder and beef and stir-fry for 5-6 mins. Next add the mushrooms and tomatoes. Bring to the boil. 3. Season well, cover tightly and cook over a low heat for 20-25 mins. 4. Add the beans and stir to mix well then return to the heat for another 10 mins. Then Serve. So today I've had overall 4 syns. I'm having a hard time trying to get my healthy A (diary products) and B(bread) into my day today. Also done quite bad getting my superfree(most veg and fruit) in today, so I may have to invest in a snack for supper.